France is a unitary semi-presidential republic located mostly in Western Europe, with several overseas regions and territories. Metropolitan France extends from the Mediterranean Sea to the English Channel and the North Sea, and from the Rhine to the Atlantic Ocean. From its shape, it is often referred to in French as l’Hexagone ("The Hexagon"). France is the largest country in Western Europe and the third-largest in Europe as a whole. It possesses the second-largest exclusive economic zone in the world. France has been a major power with strong cultural, economic, military, and political influence in Europe and around the world. France has its main ideals expressed in the 18th-century Declaration of the Rights of Man and of the Citizen. From the 17th to the early 20th century, France built the second-largest colonial empire of the time, ruling large portions of first North America and India and then Northwest and Central Africa; Madagascar; Indochina and southeast China; and many Caribbean and Pacific Islands. French police hunting for armed robbers who stole #jewels worth $9.5m from two high-security trucks south of Paris. Hundreds of new police intelligence agents will be recruited in #France, and some defence cuts will be reversed, following the attacks in #Paris. People gather at the Place de la Republique, Republic Square, in Paris, on Wednesday night following the deaths of at least twelve people in an attack by unknown gunmen on the offices of the weekly. A van struck a crowd of people Monday in Nantes, France, injuring at least nine people in addition to the driver, police said. At #France’s #Piémanson beach, generation after generation of the same families build cabins on the sand and wait for the day their paradise will be shut down for good. 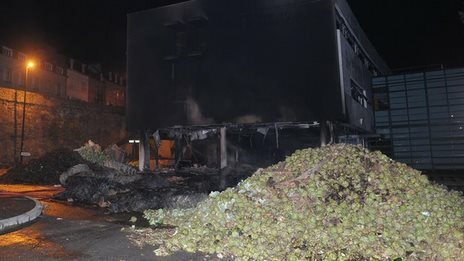 Angry #French vegetable farmers protesting against falling living standards burn down tax and insurance offices in a Brittany town.